i usally give up ...trying ..the page dosn't give a, log in? Is this justa average fan, or something a bit different?.....foreign countries?? I have had problems with the galleries also. I can get in but it takes a real long time to load. Could be that I am still using windows 7? Don Tener wrote: I have had problems with the galleries also. I can get in but it takes a real long time to load. Could be that I am still using windows 7? I'm using Windows 7 and have had no problems with it. As for the problem Jan is having, there is a Server Login prompt which should appear. If this is being blocked you may see the error shown about being logged in. See that your Internet Options, Security page isn't set to Restricted Sites or has other restrictions placed on the forum. There is a warning involved with the login message, which is due to the use of HTTP instead of HTTPS for the connection. There is a chance that your software is configured to block this for "security reasons." I would search for settings which could force HTTPS only. If you disable this, it should show the login box. I hope this helps. Please let us know what you find. Fan manufacture is 99-00. 6000 Alt is 50 cycle. 120 Alt. x 60 cycle = 7200 Alt. I access the forum through internet explorer. 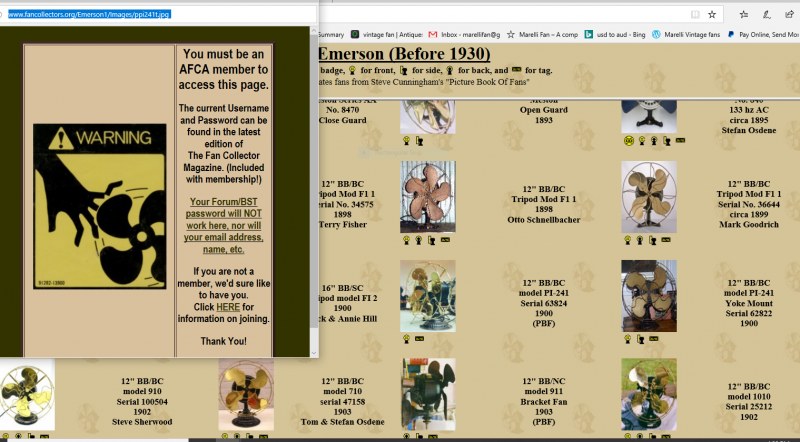 I cannot access member privileged password areas such as in the INFO section and gallery icon images with internet explorer. I have to use Google Chrome for them. At times I post and have bucket loads of code to clean off the post. There are issues which I have learned to work around using this website. 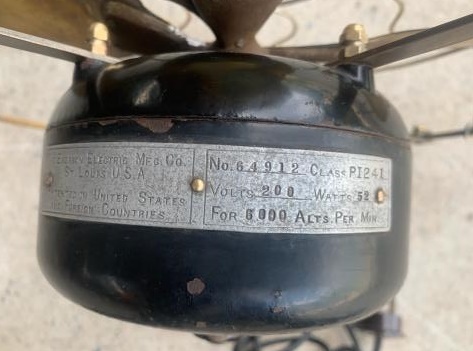 Is this the earliest fan I've seen with foreign voltage? 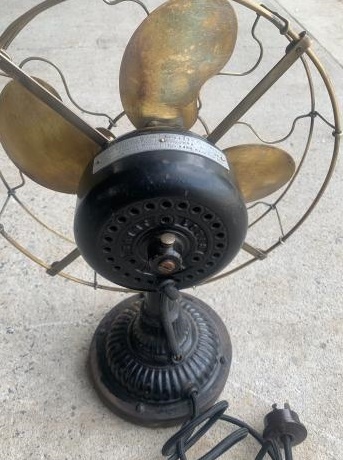 Can't vouch for earliest foreign voltage fan but very desirable and in great condition. Circa 1901. Russ Huber wrote: Fan manufacture is 99-00. 6000 Alt is 50 cycle. 120 Alt. x 60 cycle = 7200 Alt. As far as I have been able to find out the PI-241 was new for 1901 as a manual start model then modified for its last year in 1902 as an automatic start model. 1901 was also the last year for the 1898 style tripod model. I know that Jim McLaughlin's Emerson research in the galleries says 1899-1900 and believe that is not correct even if it is copied from Emerson's own papers. PI-241, PI-242 (1901-1902) Swivel & Trunnion and Swivel frame desk fan models. "Figure 20 illustrates the Emerson "Special" Model fan motor in bracket form which is new this year." Steve Stephens wrote: Russ Huber wrote: Fan manufacture is 99-00. 6000 Alt is 50 cycle. 120 Alt. x 60 cycle = 7200 Alt. I'll check it out more in depth in electrical trade. I just swiped the dates from the Emerson data. Page processed in 0.1694 seconds (19% database + 81% PHP). 33 queries executed.